I didn’t go on any property investment courses for the first 7 years of my property career. I refused to. Partly because I thought I could get all the info I needed on the internet and also because I knew there were a few charlatans out there ripping people off. No, I was fine on my own. Turns out that was a big mistake as I really struggled through those early years to make things work. Through much trial and error, I finally cracked it, and when I did, I grew my portfolio from a handful to well over 30 properties in less than 24 months (with little of my own money). It's now my mission to give you the benefit of my decade plus or property investing experience, so I've distilled it into a series of property investment courses. And you'll be pleasantly surprised when you discover that the price is a fraction of the other property investment courses you'll find on the market. John Wilson here from Property Investment Blueprint, and today I want to talk to you a bit about our property investment courses. Now, we have a few available and I'm just going to talk you through those. So first of all in our range of property investment courses, we have something we call Guerrilla Property Goldmine. Now, Guerrilla Property Goldmine is our course about how to choose your "goldmine" area, you know, the geographical area that you want to invest in. Now, the old way of doing this was to choose something miles away from you, maybe someplace in the north of England that has very high yields or something like that. But that's really not practical as many people found out, and this course will show you how to choose a great goldmine area. That's going to be very profitable for you. If not on your doorstep, then much closer, and that's going to be a lot more viable for you to use for your investing. So this course consists of a digital manual which you will take you through all the steps in choosing your gold mine area. We also have our video. It's about half an hour long of me talking you through exactly how to do the research to find an area to choose. I basically pick two areas and I researched them both and you're looking over my shoulder as I do this research and you can see exactly the decisions I make and how I do it. So that's very, very useful. So you also get a bunch of downloads and checklists with that too. So our next property investment course is Guerrilla Property Marketing. Now, this is named because it's named after the Jay Conrad Levinson book in the 80s called "Guerrilla Marketing" about how to use low-budget methods to reach your customers and grow your small business. So I've used that name because that's really what we're doing here. And what we want to do is reach motivated sellers to who want to sell their properties. Now why motivated Sellers, and why go direct? Well, first of all, we want to cut out the middleman. We want to cut out the estate agent because if you go through an estate agent -- and this is what I found in my early property career -- going through an estate agent, you might end up, you know, there's nothing against growing a relationship with an estate agent. And that way, you can maybe end up getting some deals, but to begin with you're just like everyone else. You're up against other investors, you're up against homebuyers and you're going to end up paying close to, if not full market value, but to get these 15, 20, 25, 30 percent and more discounted deals, you need to go direct to the seller. And that's what we do in Guerrilla Property Marketing. The best way to do that is by using these low budget, cost effective, techniques to reach motivated sellers. And once you do that, motivated sellers have a very different mindset to you and I, they value things like price much lower than other things like speed of sale, assurance of sale and privacy. And you can provide those things when an estate agent can't and you're able to come to a win-win solution for that seller. So that's why we go direct and this course, it's our video course, takes you through all sorts of different marketing ideas. Things that have worked for me, and it shows you how to implement them and test different methods and we also have a bunch of downloads, check sheets, and everything like that as well. So that's Guerrilla Property Marketing: all about marketing to motivated sellers. So next, we have our next property investment course is Deals on Demand. So, Deals on Demand is really the next step on from Guerrilla Property Marketing. It's how to talk to motivated sellers. Once you are in touch with them. It's all very well getting in touch with these motivated sellers, but what do you say to them when you're in touch with them? So it takes you through all the psychology and everything behind dealing with motivated sellers and shows you how to take it from the first call right through to locking down the deal. And making that into a profit for yourself. Now, to help you, one of the main features of Deals on Demand is the scripts. So we have telephone scripts that you can use, exact scripts that I've used in my business and spent a long time researching the kind of psychological triggers and elements that you need to have in there to generate rapport with your seller, to find out if they actually are genuinely motivated to sell, and to position you as the the guy or girl who is going to be the one to solve their problem. So, that's Deals on Demand and that's presented as a video course. We obviously have the scripts to download. We have the associated documentation and all sorts of other check-sheets and downloads with that as well. So that's Deals on Demand. Next, we have Guerrilla Deal Packaging. Now, many times when we get into property, we don't have that much money to invest or we've maybe run out of money. That was my case: when I started, I bought three or four investment properties and I ran out of money. So what do you do then? Well, for me deal packaging or deal sourcing is an amazing business model which you can use to get started and property or move your property business forward without having that much money to invest. And what the business model is, is you are finding deals and passing them on to other investors who can buy those deals, and doing that in exchange for a fee. So there's different types of, different levels of service that you can provide as a deal packager. Fees can range anything from one or two thousand pounds, right up to maybe even tens of thousands of pounds. At the bottom end, you may be talking about a single by to let property with a small discount, right up to the other end, you know, maybe even a land deal or a block of flats, or a large development project that's worth a lot of money to the the investor. You're finding it for them and it's therefore worth a large fee to be paid to you. And there are a few other variations in between those things. So, a very fast way to get into property as well, you know, you don't have to wait around for mortgages and and save up money. So, a way to get in there and build your network as well. So that's Guerrilla Deal Packaging and that course is digital manual and some associated downloads. Deal packaging: it's all about presenting your deal in an attractive way to investors as well. We talk about how to find people to buy your deals as well, and how to present those deals and we have templates as well, you know to present your deal attractively, in a kind of brochure format as well. And we tell you the type of things that you need to be including on on there as well. So that's Guerrilla Deal Packaging. Now to kind of back all this up. What we have is our website solution for property investors. Now, why do we have this? When you get started in property and even when you're more experienced in property, one of the biggest challenges is having credibility, right? Especially if you're very green to this. You need to establish your credibility to be dealing with motivated sellers. Now, what I found was that when I had a website, it established my credibility. When you have a website, it's a bit like having a best selling book to your name; your experience, your expertise is assumed and people are then more interested, not about you know, whether you're credible or not, but they're more interested in knowing what you can do for them. And without a website the, flip side is that you are going to struggle because the first thing people want to do if they're thinking about doing business with somebody these days is look them up online, right, and if they don't find anything then that's going to be a problem for most people, unless they're extremely motivated and they'll deal with anybody. But in this day and age, if you're going to deal with a business, that doesn't have a website, then goodness, there's something wrong there, right? Especially a transaction as big as a selling a home. They want to see that you are not a kind of Fly by Night operator that's going to disappear at the first sign of a problem. Okay. So having a website is very important and having the right type of website as well is very important. So that's why we've developed an easy and affordable website solution for property investors. Now the the kind of Flagship product that we have is a deal sourcing website, that is for you know, that's aimed at motivated sellers, so that they can go on there and they can see what you're all about. But we have, I think, nine other templates for different types of property strategy, you know, for example, if you're doing serviced accommodation, rent to rent, HMO, property development, corporate, lease options, tenant buyers. So you just pick the theme that you want and customise that. There's a done-for-you option as well, if you want to save on time and just get it done for you. Anyway, that's websites: they're very important in this day and age. So also part of our property investment courses offering is the support so, you know, having all this training is great and people, you know, we get amazing feedback from people about the training and all the value that's in there. But it's important to have some support, especially if you're new and we have that in the form of our private Facebook group. So, when you join, you get access to that and you get direct access to myself and also other investors in there of varying degrees of experience: some very experienced and others less. But you get direct access to myself to ask questions either in the Facebook group or directly, you know via Facebook message or via email, if you're not on Facebook. I know not everybody is on Facebook, so the email option is there if you need it. So that's the Facebook group and we also have something that is pretty unique in a joint venture opportunity. So your goal eventually is if you are marketing for property you're packaging property, you're sourcing property and packaging that on to other investors. Your aim is to build up your own investor list and find buyers for your own properties. And that's fairly easy. I mean to buy, you know, if you have one deal you'll need one investor to buy it, right, so you don't need a huge list. But especially if you're starting out, if you can't find a, investor for a particular deal, is maybe outside your geographical area or whatever. If you can't find one, then come to us and we will Joint Venture with you to find a buyer for that deal. We have a large investor list and many contacts with big buyers, companies that are looking for, you know dozens of units every month. So it's, no guarantees obviously, but if it's a good deal then there's a good chance that we'll be able to find a buyer for that working with you. So that's the joint venture opportunity that's included. And yeah, that's everything that we have at the moment and it's all available as part of our membership for a low monthly subscription. A lot of people join or before they join they can't believe the amount of value and training that's in there because a lot of property investment courses, you know, people will charge, you know thousands upon thousands at the high end and hundreds at the lower end for property training products, but that's not the way ours is delivered. It's a low monthly fee and while you're a member you'll get access to all of what I've described including your website. And everything so it's a lot of value and you know, if that's the only investment that you make in your property business then it's a good one. So yeah, there's a few surprise bonuses in the membership area as well. And that's pretty much everything. 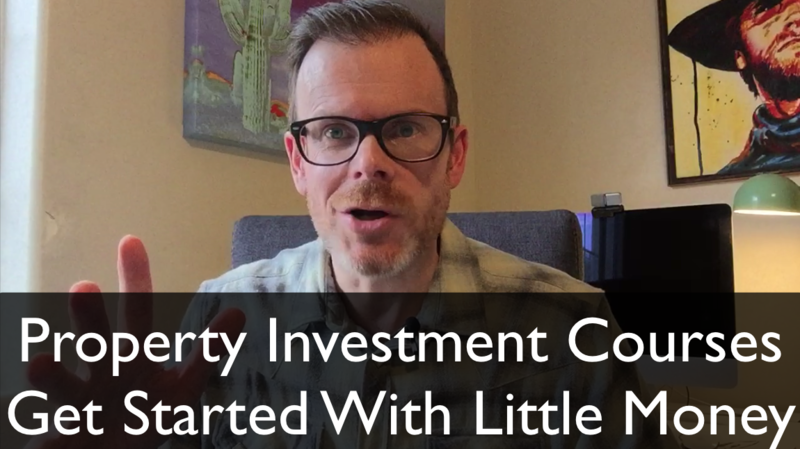 I have to say about our property investment courses and you can check it out via the link or the button below this video and you'll go to a sales page and if you purchase through that, you'll get access to everything that I have just described. And you can do that risk-free because there's are a full 30 day money back guarantee. So if you go in there, you don't like it, then just fire an email to support@propertyinvestmentblueprint.com and we will cancel and refund that for you it within the first 30 days. So, I hope you'll check out our property investment courses and I look forward to getting to know you either by email or in the Facebook group. So this has been John Wilson from Property Investment Blueprint and thanks for watching.